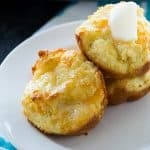 Low Carb Southern Biscuits are wonderfully light and fluffy with lots of butter flavor and a little cheddar cheese. These gluten-free biscuits are made with almond flour and are paleo and keto-friendly. Preheat oven to 400 degrees and spray a muffin tin with cooking spray. In a large bowl, whisk together almond flour, baking powder, salt, and garlic powder. In a medium bowl, lightly beat the eggs. Add sour cream and butter and mix. Add egg mixture to almond flour mixture. Stir just until mixed. Fill muffin cups 2/3 full with dough. You should get about 10 biscuits.